Sutherland Manicure Sets contain all the essentials for looking after your nails in a handy reusable bag. Each set includes metal nail clippers, tweezers, flexible emery board and a nail file. The flexible nail file is more versatile then standard nail files as it allows the nail to be filed with an even pressure which ensures a smooth finish. It is also less restricting and enables you to file into the corners of your nail. 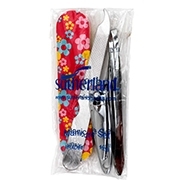 Sutherland Manicure Sets are used by medical professionals and Chiropodists in hospitals around the UK. The compact size makes Sutherland Manicure Sets ideal for travel bags, day bags and sports bags. They are also great to use on the move or at work as they are discreet and fit perfectly into small handbags.